Yesterday I joined some people in a paintball match at paintballaction.at. Since I already played a few times (one time here, one time at another company-event) I instantly agreed to participate when I was asked by ellla1981. if I'd like to play. The match yesterday was quite fun. We've been eight people, split into two teams and I've been the only one who has played before. Altough it had rained the day before, yesterday the weather was fine and the places where completely dried up. There were two fields, a smaller 35x30m and a larger one with 70x30m. We started with some matches on the small one, which had some obstacles and covers, and switched to the greater one with forts and trenches later on. In the end all of us were a bit exhausted but everyone was happy and would join another event if we manage to organize one in the future. 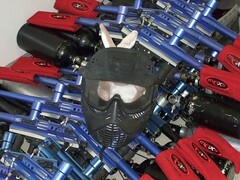 Bunny also wanted to join us but had to skip this chance when during equipping with the safety masks we found none which fit him. Some more impressions from the event are visible on my flickr-set. Afterwards I went to a barbecue where I impressed to cook a bit when I emptied my plate which he filled with three chops, two large fried sausages, and a pile of chewabchichis. Added some bread, some salad and a few drinks and this made a nice conclusion of the day. Yesterday there was a great group event: Some buddy around here at work brought up the idea of playing some rounds of Paintball over at Dukes Castle. I took the chance to experience such an event at least once in my life and for now I can say that this surely won't be the last time. We were 22 people and split up to four teams, two 5-people and two 6-people. Then we pulled up some sort of tournament where each team played two games against each other team and the team with the most wins... well, wins. Personally I think I've been quite successful and although we didn't explicitly make out a specific tactic in our team most rounds went the way that the other members of my team stayed back and covered the other team in colorful shots while I was going forward at the side of the playfield taking out one enemy after another. I don't know why I've taken out much more other players than I have been hit myself. Perhaps it is either because our enemies didn't recognize me sneaking up to them or my body shape doesn't make a good target.